The Adam R. Straus Memorial Mikvah, located at Anshe Sholom with a separate entrance behind the Shul, operates by appointments only. Please e-mail mikvah.asbi@gmail.com at least 48 hours in advance to schedule an appointment. Please indicate how you would like to be contacted, and we will be in touch as promptly as possible to confirm your appointment time. If you need to make an appointment less than 48 hours in advance, or if you have any questions, please call Mikvah Director Sara Wolkenfeld at 917-621-5671. Our mikvah conforms to the strictest Orthodox standards for kosher mikvahs, including Lubavitch standards. For questions about mikvah contruction, please contact Rabbi David Wolkenfeld at 773-248-9200 or RabbiW@asbi.org. NOTE: This mikvah is not used for conversions. Kelim (vessels) made of metal or glass (and, according to some opinions, glazed china) are immersed in the Mikvah to prepare them for use in a Jewish home. The Kelim Mikvah has a designated entrance on the east side of the building and is open during daylight hours. You can let yourself in using the combination code. Please call the shul office or email shul@asbi.org during office hours to obtain the code. It is customary to leave a donation. Adam R. Straus was a talented young man who had an unwavering love for and commitment to Judaism. His life was tragically cut short, but he has left behind a legacy for Jewish education and spirituality. This mikvah is one way in which his legacy will be fulfilled. 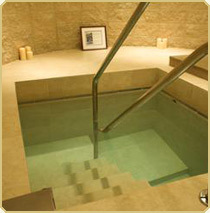 Please click on the menu titles to the left to view details about the Mikvah.